I won this great package from a local giveaway on Makyaj Günlüğü. 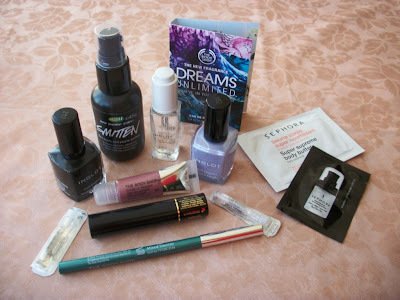 It consists of a black & a lilac nail enamels (Inglot), Lush Smitten handcream, Inglot dry & shine, Lancome excessive black mascara, The Body Shop bibrant emerald eye definer shade, The Body Shop hi-shine lip treatment, 3 perfume samples, Sephora smoothing primer sample, Sephora super supreme body butter sample. To the Attention of Bloggers!! !